Is the correct term for a restaurant that specializes in steaks "steak house" or "steakhouse"? And why do I care? Well, I care because when dealing with search engines like Google or Yahoo!, small changes in spelling can mean a lot. A search on Google for "steak house Prague" and "steakhouse Prague" yields different results, and the same is often true even when speaking just of plural vs. singular forms of the same word (e.g. a search for "mexican restaurant prague" doesn't show any results for Nelso, while a search for "mexican restaurants prague" puts Nelso on the first page of results, at #8). This is a limitation of using computer algorithms to parse the meaning of natural language queries - no human being would think of "Do you know any good steak houses in Prague?" and "Do you know any good steakhouses in Prague?" as being different questions. These would be taken as two forms of exactly the same question. What do the American restaurants call themselves? There seems to be no agreement on the correct wording. 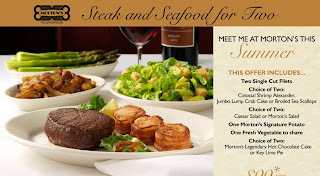 The legendary Ruth's Chris Steak House uses the two word form, while the equally well-known Morton's Steakhouse spells it as one word. Black Angus Steakhouse splits the difference, calling the place a "steakhouse", but using the title "Black Angus Steakhouse - Black Angus Restaurant, Steak House" on the home page in an attempt to reach more searchers. In the end, I'll probably change our current usage of "Steak House" to "Steakhouse" just to satisfy Google. A search for "steakhouse" on Google yields 17,700,000 results, while a search for "steak house" yields 9,230,000 results. In fact, a search for "steak house" on Google offers up the suggestion "Did you mean: steakhouse?". That's all the convincing I need. Currently, Nelso generates 100% of its revenue from Google AdSense. We're fairly happy with the results so far, but in the interest of doing our homework, from today we're going to split the ad impressions on nelso.cz evenly between AdSense and Centrum's AdFox. That is, half the visitors to Nelso.cz will see ads from Google, and half will see ads from AdFox. We'll check on the results after a month and see how they did. We still have very few listings for Slovakia, but we've launched a version of Nelso in Slovak at Nelso.sk. We'll go down to Bratislava in August 2008 to start collecting data, initially focusing on pubs and bars, restaurants, and hotels. It's important to note that on January 1, 2009, Slovakia will join the Euro, which should give it a small bump in tourism. By that time we'll have complete listings for a number of cities in Slovakia and will be ready for the influx of tourists. With the launch today of Nelso.fr, we now have all the major languages in Europe covered on Nelso. We have the site in English, German, French, Spanish, Italian, and Russian. There are no less than three (#10, #12, and #18) Prague tattoo parlors that appear in the top 20. One often thinks of local search in terms of bars and restaurants, but only seven of the top 20 are in the "food and drink" category. One distinct change in this list versus earlier in the year is the appearance of three Prague swimming pools on the list (I'm including the swimming pool at the Olšanka Hotel, as it's known more for its pool than its hotel). What will be the most popular winter spots? According to the U.S.-funded World Values Survey, Denmark is currently the happiest country on earth (Zimbabwe is the least happy country). Puerto Rico and Colombia also rank highly, along with Northern Ireland, Iceland, Switzerland, Ireland, the Netherlands, Canada and Sweden. Of the countries in this list, Nelso listings currently cover only Denmark, although we do plan to cover Holland and Switzerland soon. I've always been interested in providing listings for Iceland on Nelso (particularly Reykjavík), but unfortunately, neither Yahoo nor Google have street-level maps for Reykjavík. I have no idea why a country like Iceland would not be represented on Google maps; perhaps there are some legal issues to be sorted out? I went to the home page of Nelso.com earlier today, and was greeted with the page you see in the screenshot below (click the image to enlarge). Yes, that is exactly who you think it is looking out the window of Prague Castle at the city of Prague below. How did this happen? Well, it's a result of the "interestingness" algorithm of Flickr. To place random images of a place on the Nelso city home pages, I make a call to Flickr for photos tagged with that place name and then sorted by "interestingness". 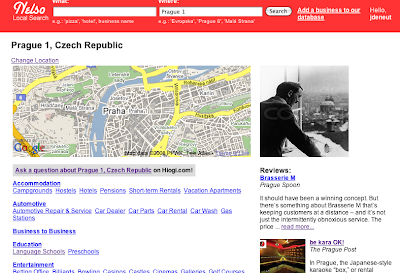 Usually, this works very well, and returns great photos of Prague 8, or Berlin, etc. Unfortunately, it sometimes returns photos like the one of the very bad man that made it onto the home page of Nelso.com. I may have to re-think my use of Flickr photos.